The program has a simple interface with buttons to complete the tasks it is capable of performing. It can quickly detect your device, though if it doesn't, it Nokia X Manager probably isn't capable of modifying your phone. Be sure to enable USB debugging before trying anything! In other features, Nokia X Manager can also manage APK apps by installing or uninstalling them. It also provides full access to the ADB shell and perform an ADP push. Rooting your Nokia phone with Nokia X Manager is as simple as clicking on the "Root Device" button while reversing root is just as simple. 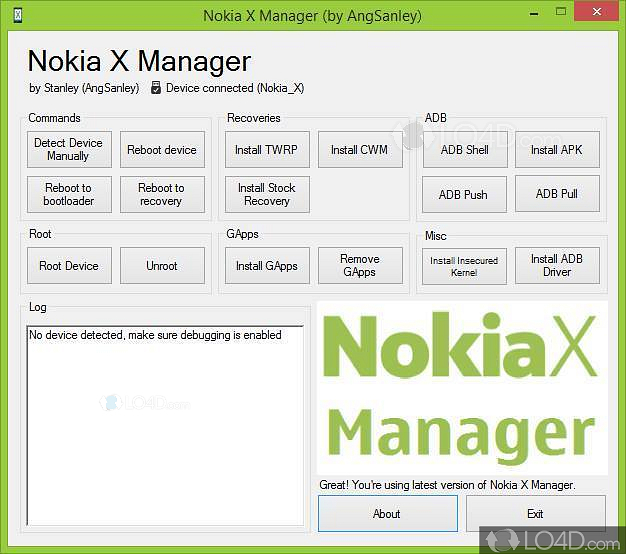 Nokia X Manager is licensed as freeware for the Windows (32-bit and 64-bit) operating system / platform from mobile phone tools without restrictions. 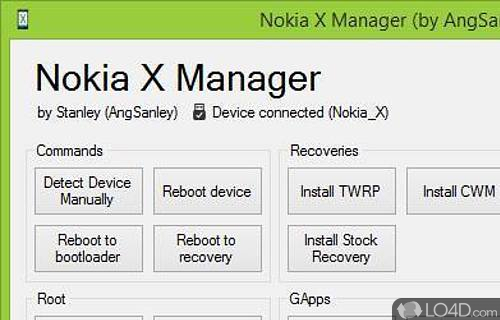 Nokia X Manager 1.1.0.0 is available to all software users as a free download (Freeware). Compatibility with this software may vary, but will generally run fine under Microsoft Windows 10, 8, 8.1, 7, Vista and XP on either a 32-bit or 64-bit setup. A separate x64 version of Nokia X Manager may be available from Snoop05. This download is distributed as Setup_NokiaXMgr_v1.1.0.0.exe. We have tested Nokia X Manager 1.1.0.0 against malware with several different programs. We certify that this program is clean of viruses, malware and trojans. 4.1 out of 5 based on 251 ratings.